IdentoGo by MorphoTrust USA does live scan (electronic) fingerprinting at the Groesbeck ISD Service and Support Building located at 607 S. Ellis in Groesbeck. 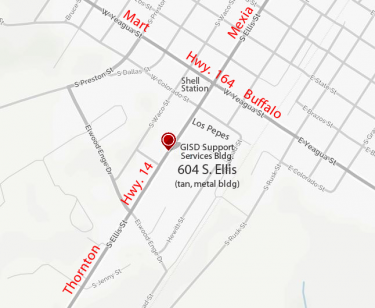 (The GISD Support Service Building is a large tan metal building.) GISD only rents office space for the fingerprinting to be completed, we do not make appointments or do the fingerprinting. If you have questions, please call IdentoGo by MorphoTrust USA at (888) 467-2080 or visit www.identogo.com or click on the IdentoGo logo. Starting January 28, 2019, IdentoGo will begin coming to Groesbeck as well as their scheduled Wednesdays. The office that they rent from GISD will be open Mondays and Wednesdays except on school holidays or holidays for IdentoGo. Should you have questions regarding fingerprinting please do not call GISD (254-729-4100, 254-729-4136 or 254-729-4190). GISD only rents office space for the fingerprinting to be completed, we do not make appointments or do the fingerprinting.